Most great photographers tend to have a mental checklist of shots that they must get on the day of a wedding. In my mind, this checklist includes an artistic wide shot featuring the bride and groom with an interesting landscape. Often times, I strive to achieve a work of art that the couple would want to display in their home. The setting of this essential shot can range from an open country field to somewhere deep in the bush, such as this photo taken in Ontario, Canada, where there is an abundance of forests and shrubbery. There is something particularly magical and enchanting about the atmosphere of a tall pine forest. 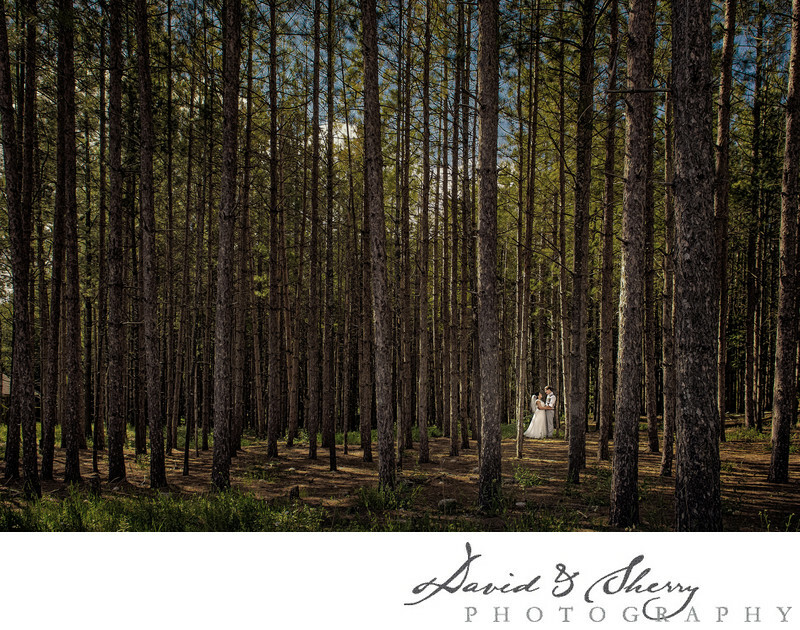 The giant trees surrounding the couple in this picture make them appear quite small, but the strategic placement of the subjects and the natural sunlight peaking through the trees of makes the bride and groom stand out and appear bright against the dark setting. I love creating masterpieces using the natural surroundings we are given to work with during formal shoots. It is always a fun challenge to get a shot that can be made into a canvas to hang on the wall; a great piece for a newly married couple to make their house a home.